I went to a rugby game yesterday that made me smile. A visiting American high school team played a mixed team yesterday from the area who rocked the MAC colors. There's no other way to describe the game other than cute. It's like when you see a little kitten trying to climb up onto the couch and they keep falling off, but consistently try again. Not to blow smoke up NZ's rear-end, but when it comes to rugby - we've got it, by a mile. 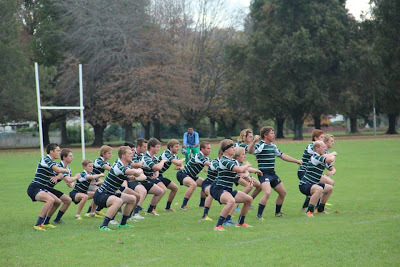 Combined, the Snow Canyon team would have weighed 900kgs, an average of 60kgs per player. The other team would have upped them by 600kgs, easily. This side had power and strength, but the Americans had speed and drive and that's what made the match. And when they put a little guy, Wyatt? (3rd - back row), on as scrum-half (no pun intended), it only got cuter. He was so tiny he could have walked through the middle of the scrum upright. They even did a haka. That alone is worth a try and conversion. They didn't win in points, but they won in heart. Cute alright. That's pretty ballzie to come to NZ and play them in rugby.